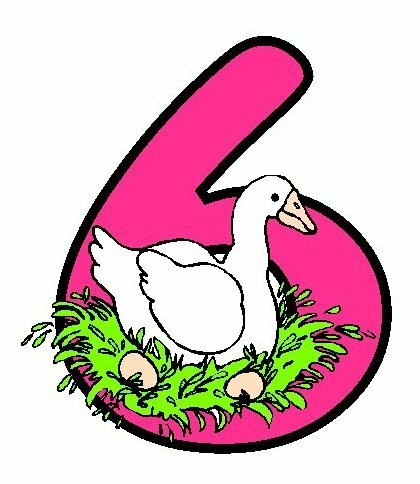 Welcome back to A WandafulThing 12 Days of Christmas, this is Day 6 so we are half way there. This gift includes vintage items and a bonus delicious recipe. There is never a shortage of stem or glassware at vintage and thrift stores but often times you cannot find complete sets. For this gift I wanted a set of four matching glasses and I was delighted when I spied these for $1.00 each. 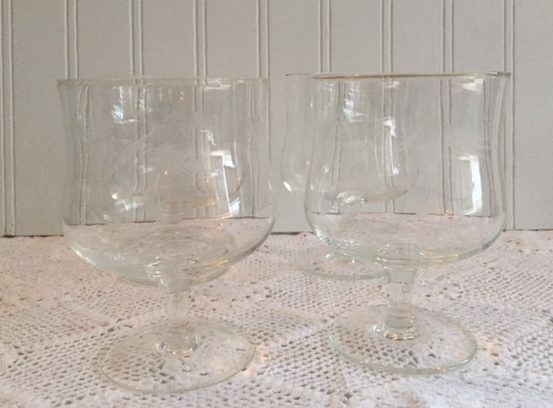 I do believe they are brandy glasses,they have a beautiful etched wheat pattern. 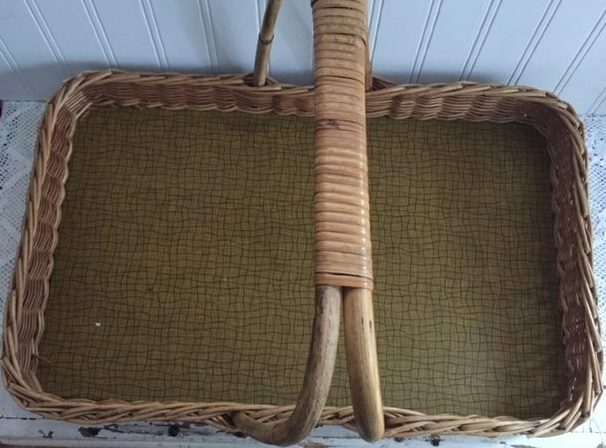 I found this tray at an estate sale and was immediately drawn to it due to the fact it was wicker, was rectangular and had a handle. I admit it’s not much to look at but oh the possibilities it holds. I was going to paint it but I’m holding off for now as I really like the rustic look of it and I think with a few embellishments it will be perfect for delivering this gift. Check out how some simple paper napkins helped make this tray look festive. Since I mentioned a recipe earlier, I won’t keep you waiting any longer to find out what I put in those beautiful etched brandy glasses. 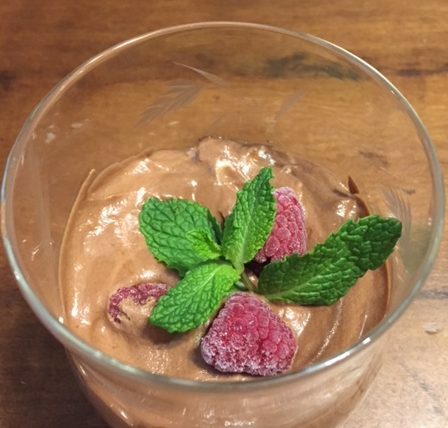 Oh sooo decadent Peppermint Mousse. 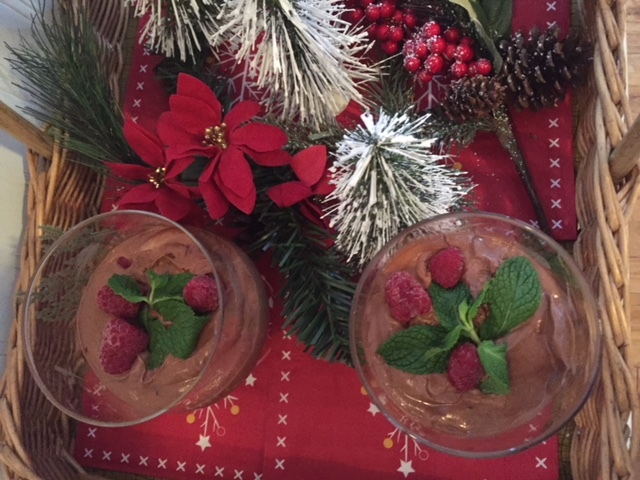 The recipe that follows made exactly enough to fill the four glasses, you don’t need to garnish the mousse but I had some mint and some frozen raspberries, so why not? This is my go-to dessert recipe for the rest of 2017. The recipe is courtesy of doTerra essential oils and can be found here. 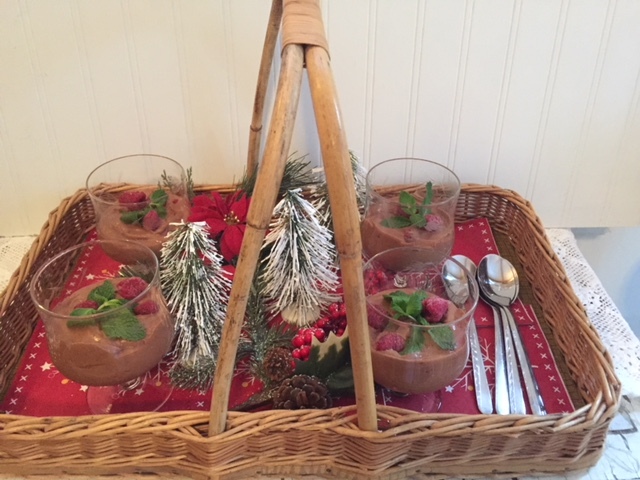 Add some bottle brush trees and a bit of greenery to the tray, throw in some spoons (the napkins are already there) and you are ready to deliver a wonderful dessert that includes the dishes. It’s always fun to use something in a different way than it was intended and this gift does exactly that. A delicious gift in vintage glasses, delivered in a vintage tray – its A Wandafulthing! 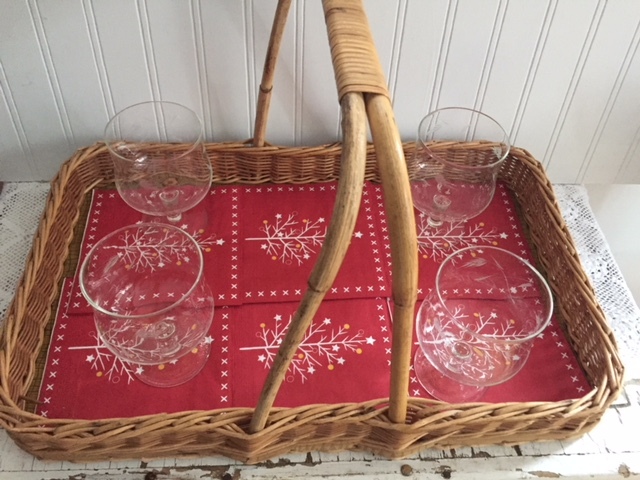 This entry was posted in Bake, DIY, Food, Make, vintage and tagged 12, 12 days, brandy, Christmas, doterra, gifted, gifts, glasses, mousse, napkins, nuts, peppermint, Recipes, thrifted, tray, vintage, wheat pattern, wicker. Bookmark the permalink. I love upcycling baskets. i give them a quick bath in soapy water and a scrub with my bottle brush, air dry, often give them a coat of clear spray or more paint; the basket will look brand new! I especailly like making “be good to yourself baskets”. A mix of storebought and homemade bath/beauty/grooming treats. Candles. Candy. Homemade Epsom bath salts and sugar scrubs. They are always appreciated! That is fantastic advise regarding up cycling baskets, I am definitely taking your instructions regarding cleaning any thrift or vintage baskets I find from now on. Merry Christmas! It looks beautiful. The tray, glasses and the mouse. Love the added greenery. Can’t believe we are 1/2 through the 12 days! !